Nitzanit Riklin calls on women to join her in a hunger strike against the demolition of Judea, Samaria homes. Nitzanit Riklin has become the first woman to join the ongoing hunger strike against the demolition of Israeli homes in Judea and Samaria. 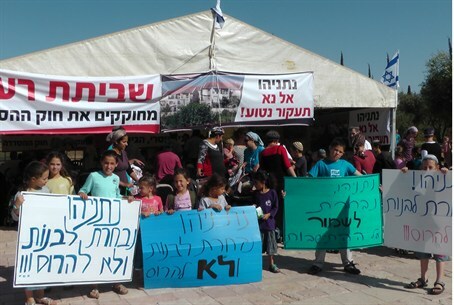 Hunger strikers are calling on the government to pass the Regulation Law, which would protect legally built homes in established Israeli communities from destruction. Demolitions ordered by the Supreme Court have been based on rulings that the homes are built on land owned by Palestinian Authority Arabs, although this is disputed and if not, the option of monetary compensation for bona fide errors in land registration has not been utilized. One challenge for Jewish hunger strikers is deciding what to do on the Sabbath. “From a halakhic (Jewish legal) prospective, we have to enjoy the Sabbath,” said Riklin. “On the other hand, eating is not something I would enjoy today.” Fasting, except for Yom Kippur, is not allowed on the Sabbath. Palestinian Authority terrorists imprisoned in Israel recently won concessions from Israel after a weeks-long hunger strike.